From left, Lorraine Condon Knorr, grandmother to 9/11 victim William Christopher Hunt, and Diane Hunt, his mother, stand near a garden that was created in William's honor. 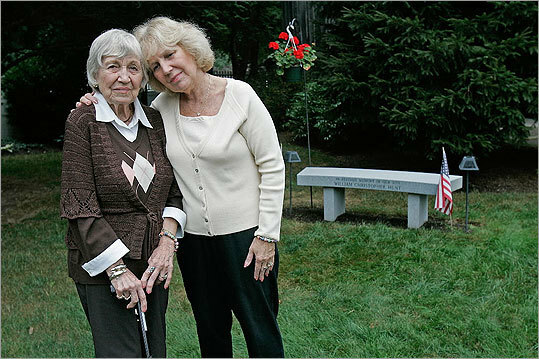 The bench in her Kingston backyard was provided by the South Shore chapter of the American Red Cross. William Hunt has several memorials in Kingston: A flag of honor and a plaque were donated to Kingston Town Hall, and Sacred Heart High School planted two cherry trees in his honor.